Yo’ Good? It sure is! H&N Perry would like to extend a very warm welcome to one of our newest tenants, Yo’ Good. Newly opened in The Plaza, Yo’ Good produces their own range of frozen yoghurts on site. Some of their delicious flavours include salted caramel, coconut and mango, along with the more traditional french vanilla, strawberry, chocolate and natural. Proprietors, Michael and Aleksandra invite their customers to mix their own yoghurt combination and then top it off with a range of interesting delights including skittles, strawberry pearls, marshmallow, mango pieces, turkish delight and much more. There’s also a range of ice cold ‘Emma & Toms’ beverages available which are largely made from organic, preservative free juices. On hot days like these, it is an extremely welcoming place to take a break. The Plaza, which runs along the corner of Mandurah Terrace and Tuckey Street is a fantastic location for this tourist friendly business. Yo’ Good join fellow successful retailers in The Plaza such as Salt Bistro, True Blue Gallery, Janice’s Coffee Pot, Squeeze & Grind Coffee & Juice, Your Hairy Friend, Foreshore Turkish Pizzas, Jesters Pies, Gommes Shoes, Australian Red Cross, Carries Boutique, The Bather Bar and Community Solutions. H&N Perry are responsible for managing all of the leases in the Plaza Complex. Our commercial property management team have a great deal of experience in securing leases and managing large commercial complexes along with industrial units and office buildings. If you’re looking for the best property managers in Mandurah to take care of your commercial investment, call H&N Perry on 9535 1822. Looking For A Rental Property? Book Inspect Today! H&N Perry have recently introduced a new method for potential residential tenants to book property viewings. Designed to make things easier for all parties, a ‘Book Inspection’ button has been added to all of our listings. This ‘Book Inspection’ button is easily located next to all of our rental properties on the H&N Perry website. When a potential tenant is interested in a particular property, they can use this button to request a viewing. A message will immediately be sent to our Property Managers alerting them to the request. The system collects the tenant’s mobile telephone number and sends them information regarding home open times via a text message. Tenants then have a clearly written message with the property’s details and home open times. One of the biggest advantages to this system is that it eliminates the need for lengthy phone conversations which is beneficial for both tenants and Property Managers. At H&N Perry, our Property Management department pride themselves on providing an easy, helpful service. We believe that our proficient use of this up to date technology will make booking an inspection a much smoother process for all involved. 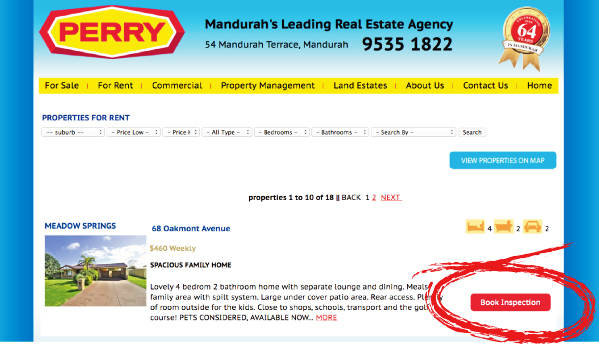 If you’re looking for a rental in the Mandurah area, why not visit our website hnperry.com.au and try it our for yourself? 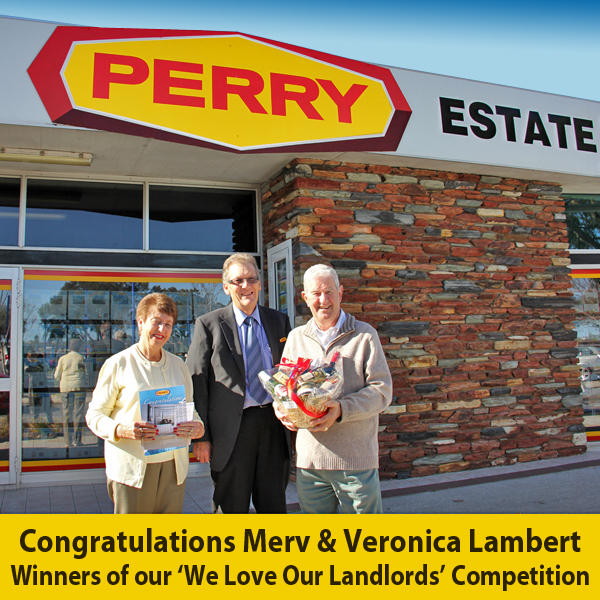 H&N Perry would like to congratulate Merv & Veronica Lambert who are the lucky winners of our ‘We Love Our Landlords’ competition. They will be enjoying a luxurious one night stay at Crown Metropol Perth in a Luxe Suite with breakfast included. The competition was run during the month of July and was open to all of our residential and commercial property owners. We appreciate the continued support of our customers and believe in rewarding them whenever we can. If you aren’t getting the service that you deserve, maybe it’s time to switch to Mandurah’s leading property managers – H&N Perry. Call Brian Matthews or Jan Wiley on 9535 1822 today to discuss your property management needs.